We are looking for an experienced supervisor to join us on our events team for the summer. This is a 7 month contract and may suit someone between winter seasons or gap year students with experience in the industry. The ideal candidate will need to be a team player and have experience of event catering or working in the hospitality sector at a supervisory level. You will be naturally passionate about customer care, an eye for detail and excellent organisation and communication skills. The role will involve the day to day supervising for on site events, as well as off-site catering and dining in the surrounding areas of Bristol. You will need a Full Driving Licence and own transport ideally. We are recruiting front of house events staff to join our team, working on large and small events throughout the year. This is a varied role, no two events are the same therefore candidates must be versatile and have experience within the catering industry. We are a professional team with high standards, a smart appearance a friendly demeanour is a must. We are based in central Bristol but have catering contracts in South Wales and cater events throughout the South West. Access to a car is an advantage but not a necessity. We are looking to recruit a full-time chef to work alongside the Executive Chef and Head Chef within our business at numerous sites. We are looking for a chef who is trained to a sous chef level. You should be confident to lead a junior team and delegate where required. Time management and prioritisation skills are a must. Transport is essential-due to the nature of the business you could potentially be working in Bristol in the morning and then South Wales in the evening! Level two food hygiene certificate is a must and written and verbal references will be required upon interview. We are looking for an experienced chef de partie to join us on a 7 month contract over the summer, starting at the end of March 2016. The ideal candidate will be a team player and have experience of event catering, banqueting or working in the hospitality catering sector. 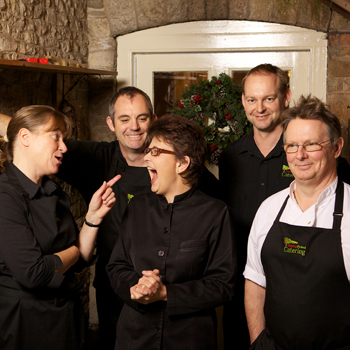 You will be naturally passionate about food, an eye for detail and excellent organisation and communication skills. The role will involve the day to day preparation of food for events, as well as off-site catering and dining in the surrounding areas of Bristol and South Wales.